People spend a lot of time contemplating the New Order and, more particularly, its Code. A lot of thought has gone into the design of highsec's great transformation. If you're a carebear and you lost a bunch of isk because New Order gankers killed you, you can take comfort in this. You were killed for a reason. Many good reasons, in fact. Agent Sophaya Fortelleren was contemplating the Code over the course of a few days and was inspired to write about it. 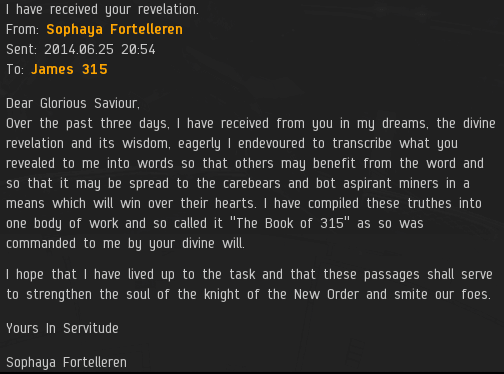 Today I present to you Sophaya's "Book of 315" in its complete, unedited form. In the beginning there was the void. This void had substance but no form. In these days things were moral, ye' there was no morality, the word was not needed, things were as the were. What was the nature of this void? From the void was crafted stars, and gas and bodies of rock, planets most noble, and asteroids, big in those days. Things were as they were. Then came the gates, and then the stations, and the first ships of the first people, These were pure, not made from the void but produced whole. Things remained as they were. Living in the stations, the people of this time took to conflict, within the void but never touching but each other, their ships refurnished and weapons reloaded by the purity of their pursuit. Things were as they were. In those days, prestige was the currency of the peoples. Honour of combat inspired the hearts and favour of all. But there was those who eschewed this, finding themselves not proficient in combat. These people schemed for other ways to prestige. Growing disrespectful of their peers, these people schemed and plotted, thirsty for their own path to prestige, turning their gaze upon land around them, they began to plunder the great rock bodies, they called themselves Miners. For the first time, the world shook. Extracting the ores, the Miners did refine it to minerals, and then to ships and items. The theft of nature defiled the purity of nature and abolished the divine balance of nature. Ships were found no longer to be rebuilt, ammo no longer to replenish, creation of modules quickened no more but through the production of minerals. The downfall was manifest. Still the Miners did not repent, eagerly they exalted this new slavery to minerals, they called it Industry. Eagerly they sought to pass on this slavery unto their once prestigious kin, binding the PvPer to this new found scarcity, gleefully they called this arrangement the Economy, forcing the PvPer to acquire their ships through idols of false prestige, which they called ISK. Seizing the reigns of power in the now corrupted world, the Miner sought to produce their own utopia in which the aristocracy of Industry and Economy would flourish. They divided the fertile lands and called them High Sec, outlawing all combat under pain of death. With malice was created Low Sec, barren and arid, worst still was created Null Sec. The PvPers were exiled unto this place, where upon the moral do now dwell. And so the purity and balance of the early world was forever lost, space divided, inequality and iniquity were the pillars of life, the Miners gleeful of their crimes, mined on, perfecting their tools and craft. Each day their corruption grew and their minds ceased to quicken, these were the first Aspirants. In the fertile lands was bred a corruption most insidious and foul, from the Miners it did spread, a dullness in the mind and decadence of wealth, the attention of these people turned from their self imposed slavery unto that of their self imposed sin. Aspiring to all that is foul, so cometh the Aspirant. The aspirant seeks wealth through unconscious action, in their greed they abdicate their minds and affront those whose lives are honest. Thirsty for that of which they perform no earning. Exterminated they must be, placed upon them are maledictions three. Cursed is the Miner, who through sacrifice of all that was pure, strip the universe bare of its flesh. This they do without attention. This they do without consciousness, this they do without honour. Cursed is the Freighter, complicit to the miners, descendants of their aspirancy, they move through the cosmos hauling ill-gotten spoils in their bloated bellies. If Miners are the head of corruption, the Freighter is so the instrument of the right hand. Without mind they move like venom or disease in the veins of a sick child. Cursed be the one that would follow the path of aspirancy. Upon gates they sit, in belts they lay, outside stations they sleep, and in the blackness of deadspace they lurk. Verily these are the vagrants, the shiftless disinherited, pay them no kindness, for all are united in aspirancy. And what of those uncorrupted? As the darkest days befell the cosmos, crushed under the heel of Industry, those prestigious ones, those dependables, those desperate few, cried out into the burning void, they cried for respite and a sight of salvation, and lo' a voice answered. Manifest came a man, upon his heart a number counting 315, in the system of Halaima. “Bringeth unto me all those most pure, whom deplore and admonish the black tyranny of this time, bring them here unto me, for I answer thine call, accept ye thine answer” Said he, and for six stellar days and nights, those from the regions of low and null security flocked unto this man. He cast his righteous gaze upon High Sec and upon it declared a code, holy guidance to rid the cosmos of the aspirant and the greedy. Those whom came to him he made his apostles, and to them he granted the Catalyst. “Taketh the Code and the Catalyst, and go forth and cleanse the belts, the gates, and even the stations, from this day onward hope and salvation have returned”. caused by the Miner, he did create the Procurer and the Skiff for those who would repent their idle nature. And to them he commanded that through obedience and sacrifice of a token of the ISK they so loved, that an indulgence would be bestowed upon them, so that they may taint this world no longer. He hath bestowed a panacea unto the faithful, with the purpose set and will defined, he proclaimed a New Order upon high sec. The cure rests within the action of cleansing, of which was called the Gank. Through anti-matter and mercy the disease will be cleansed. Certainly, he had only come here seeking peace, he had not came to leave. Blessed are they that take up the work of the order. With the catalyst the aspirant is burnt, with mercy clemency is offered. What gratitude we owe to these knights, whom in their grace forsake the temptations of ISK, and take not to their own enjoyment, but for the sake of all, do exorcise the carebear. The freighter howls a death cry, it's carapace broken as its lifeblood exsanguinates across the void. It's abominable existence is purged by those paladins, brave in their task, tireless in it's execution. Unto them our thanks are rendered, blessed art they. Resolute they land amongst the asteroids, with purpose they lock the miner. Unleashing their fury, the miner is laid to waste for their multitudinous crimes. With glory and bravery, the paladins of the New Order endure the injustice that is CONCORD. Praise be upon them in these dark times. O' knight of the order, thy dwelling is poverty, no expensive ships do you own, no money in your account, in this life thou art a pauper, for the sake of thine task you accept this suffering. But in your hearts lay purity whose measure rises higher than that of any great wealth, each time the gank is performed a brick added to thy spiritual palace. Praise upon you, the knights, ye' mendicants. Repent ye sinners all! Lest your barges your freighters your pods and your tears meet our great and righteous anger, convo me for your permits. Now let us pray: PRAISE JAMES! Indeed! Praise James. Long love the New Order of Halaima !! I think what you meant to say was "what a crock of gold". You asshats are getting more hilarious by the day, the laughing stock of New Eden. Absolutely. More power to the Code! It all makes sense now. The coming of James and the CODE had been foretold. Only something as beautiful as the CODE could cause people's realities to shift so much. "Each line held the undeniable meaning of a concept. There was Fire. There was Cold. He saw Black Mountain. A dark Sea. A Flight. This Freedom. This Truth. An Honesty. A Death"
I prefer the Noah take on things, myself. "A great Code is coming. It cannot be stopped, but it can be survived. We must buy... a Permit." So wonderful :) Came expecting a smile and a laugh, left happy. With this Book of James 315, CODE should officially change its name to celebrate. From CODE to CULT (that's a good book title too). James should also update his name (if only CCP would introduce name change for PLEX). From James 315 to Jame Koresh. You don't like, do comedy / parody / humor well, do well? DJ, don't be an RP fail. Just be careful when the Free Brotherhood of Isanamo (F.B.I.) come knocking. You don't want to burn along with the rest of your cult. You appear to be referencing IRL (American?) events then claiming "RP fail" in others, apparently unaware of the irony. Be less stupid maybe? Free Brotherhood of Isanamo (FBI - nice catch)? We await you and your inevitable demise, like all the whiteknight corps/alliances/coalitions before you. /me sighs and tries again. DJ, I think you still need a rabbit, a hat, a bat and a '64 impala.. and then do a somersault while chanting 'We Are The People' by Empire Of The Sun. The somersault is the key here, though! You mess that up and you're screwed; it's game over! No RP soup for you! That was a work of Art - worthy of many readings and much contemplation. All children of New Eden are welcome in the New Order. We will embrace you with open arms. Simply accept James 315 as your Saviour, as I and many others have done, accept the Code, and transcend into a higher state of being. Of course, making highsec a better place comes at a cost. Please look into your wallets and empty what you can do without into the coffers of the New Order. Buy shares to help us make EVE better for everyone. I have experienced no greater joy than through my investments into a great cause, bigger and more important than myself. If I had a trillion isk, I would give it all to James 315 in the form of shares. Of course, I don't expect that much, but please consider a small tithe of 10-25% your wallet balance. A scripture of such beauty that my soul was warmed and enlightened by the very words. Truly the fabric of the universe itself has manifest a prophet among us in Sophaya Fortelleren. James 315 spoke and New Eden has answered him back. The light of the Code extinguishes all dark places. We are all blessed by this gospel. What magnificent portent. I give thanks for James 315, the Prophet Agent Sophaya Fortelleren, and that I am so lucky to live in such interesting times.